Overview: Behold nature's awesome power with Volcano Bonus, a 5-reel, 9-line slot. Set on an indigenous island paradise with an active volcano looming ominously on the horizon, this game sets up you up to bet 1-5 coins per line with each coin valued from 0.02 to 1.0. 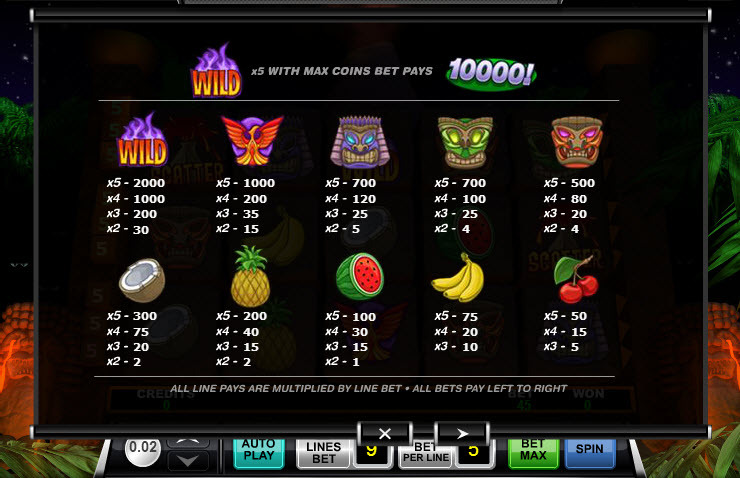 Score 5 "Wild" symbols while betting with max coins and win 10,000 credits in one explosive moment. Also, get 3 or more symbols positioned anywhere on screen and get paid corresponding credits. 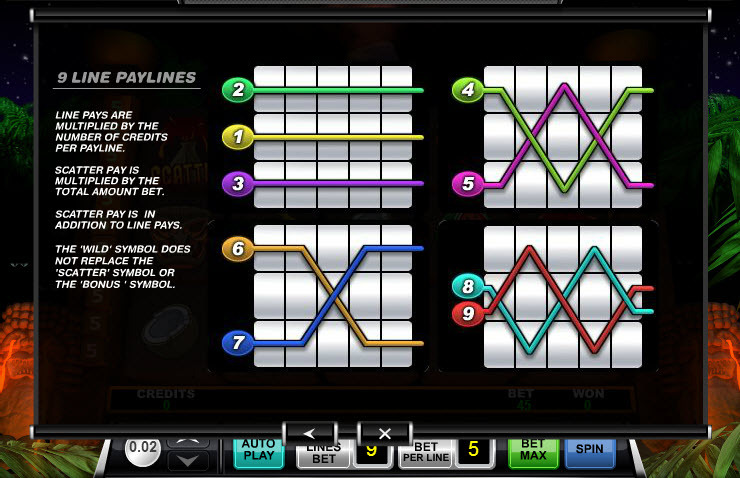 3 symbols will pay 5 credits, 4 will pay 50, and 5 will pay 500, to be multiplied by the total amount bet across all pay lines. Meanwhile, 3 skull and bones bonus symbols anywhere on an active pay line will bring you to the Lava Lake bonus game. Click on the 12 rocks floating in a pool of lava and collect their corresponding credits. 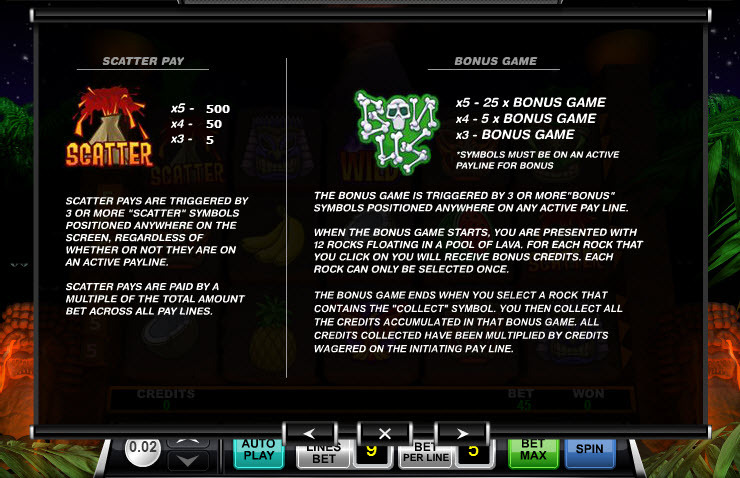 Keep clicking until the rock revealing "Collect" is selected, which would spell the end of the bonus round. Each rock can be selected just once within the Lava Lake bonus game. 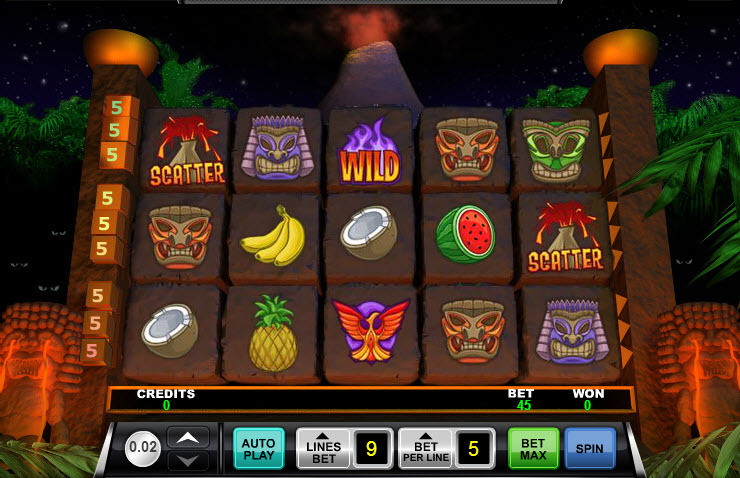 Similar Slots: If you like Volcano Bonus, you might like these other slot machines from Ace Gaming: Bar Room Blast, Cross Country Reels, Freak Show, King's Castle, Roughneck Reels, Samurai Slot.